The Live Monitor can be used to output data to Race Technology equipment. This is useful to diagnose problems and check the configuration of a display after setting it up. There are 3 ways data can be output from the Live Monitor software. The 2 most commonly used are either to output a pre-recorded .RUN file (lots of channels), or output arbitrary data on a message with the selected index. It is also possible to connect both a data logger and a display to the Live Monitor and output the data that is received from the data logger to the display. This allows the received data to be monitored on the PC to check it is received correctly, then checked on the display that it is displayed correctly. To output data connect the Race Technology product to the Serial/USB port of the PC, select the correct port and click �Connect� Go to the �Display� drop down menu and select �Show data output options�. Open the file open dialog by clicking on the browse button and then select a run file. 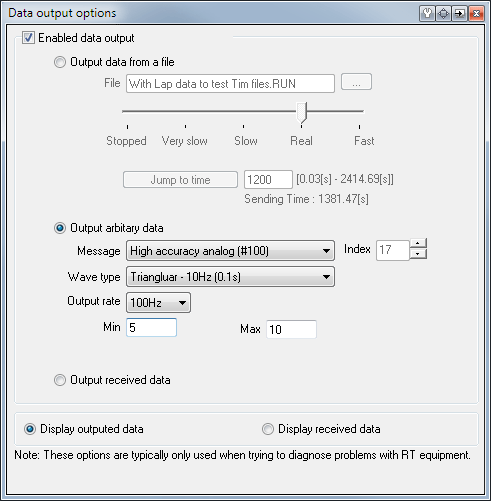 Select the data output rate by changing the slider under the file name box. 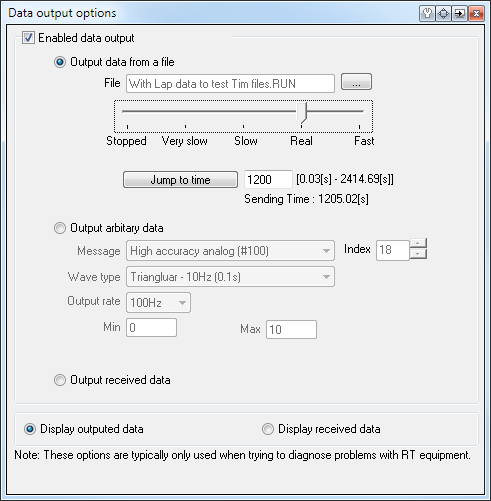 Setting the slider to the �Real� position will output the data in the same speed as it get recorded to the file. You can jump to specific time by entering the time and clicking on the �Jump to time� button. To view the outputted data, select the �Display outputted data� option. First select the Message and the index. Then select the output message pattern. Then select the output rate.